Climate Common Sense: Professor Carter Corrects Climate Commissioners Oral Exam --- Fail! Here is a small selection of some of the other incorrect technical statements, and their implications, that were made by the commissioners. Assertion: Human-caused global warming is continuing, and we are in danger of seeing it augmented by positive feedback loops. Reality: There is no direct evidence that the mild warming that occurred between 1979 and 1998 was mostly, or even measurably, a result of human carbon dioxide emissions, despite the pseudo-scientific assertion to that effect by the IPCC. Second, there has been no global warming at all for the last 15 years despite, the operation throughout of the self-same feedback loops. Assertion: Industrial carbon dioxide emissions are currently ~300 billion tonnes annually and they need to be limited to ~700 billion tonnes in future to stabilize the temperature at no more than 2 deg. C above the pre-industrial temperature. 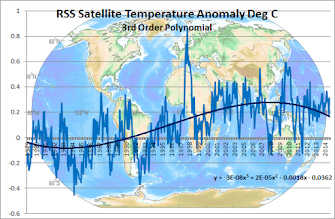 Reality: There is no evidence that a 2 deg. C warming (which would take the planet back to about the temperature levels of the Climatic Optimum that occurred about 10,000 years ago) would be damaging for the environment, or for human activities in any substantial way that we couldn’t adapt to. And, even should natural global warming resume in the future, as it very well may as part of a continuing bounce back from the hostile conditions of the Little Ice Age, there is no certainty that restricting carbon dioxide emissions will do anything to halt the rise. First, because of the diminishing warming effectiveness of every increment of carbon dioxide that is added to the atmosphere, and second because the assumed efficacy of limiting emissions to 700 billion tonnes is a projection of computer models that are known to be faulty. Assertion: We live today during a long, stable period of climate with no expectable change for the next 20-30 thousand years, and we are now seeing a temperature increase above that due to human carbon dioxide emissions. Reality: There are three things wrong with this statement. First, the stable period referred to is called the Holocene. The Holocene has already lasted 10,000 years, during which time (i) a long term cooling of 1-2 deg. C has occurred; and (ii) regular temperature oscillations of about 1 deg. C have occurred on multidecadal and centennial time scales, the last of which occurred during the 20th century. Third, we are not seeing any increase in temperature above the long-term Holocene average at the moment, and there is no empirical evidence that the mild warming of the late 20th century had a dominantly human causation. Assertion: The scientific community is more than 90% sure that we are not seeing a natural warming at the moment; this is as strong a consensus as you will ever get. Reality: The scientists amongst the Commissioners clearly mix in a different scientific community to the one that I inhabit. I believe that the community that they refer to is the restricted group of scientists who are associated with the IPCC. It is indeed true that the majority of IPCC scientists are convinced that dangerous global warming is occurring, or will occur, and therein lies the problem. Yes, natural climate change and events are definitely an environmental and socio-political hazard, and yes we should prepare better for them and adapt better to them when they occur. Such a commonsense policy is, of course, not only cost-effective, but is also precautionary against any human-caused change that might occur in the future - but which has not been manifest yet. Second, and as has been said so many times before, consensus is a political concept that has nothing to do with science. For were the Commissioners to tell us is that there is a scientific consensus that the sun will rise tomorrow, everyone would wonder what was wrong with them that they should choose such peculiar, deliberately non-scientific, language. Assertion: We do not hear a debate in the scientific community between IPCC-supporting scientists and other, independent scientists because no such debate exists. “There is no debate and there has been no debate for a couple of decades”. Reality: That credentialed scientists can make statements like this on a public platform is extraordinary. The statement is, of course, false, and reveals far more about its author than it does about the real state of scientific discussion regarding climate change. Assertion: The Melbourne heat wave in 2009 set a temperature record that was 3 deg. C higher than previously. Similar temperatures will be everyday events by the end of this century. Reality: This is typical of the sort of nonsensical alarmist statements that are made by persons possessed of a naïve faith that computer models can make predictions about future climate states. They cannot, as even the modelling practitioners themselves concede. This report relates to climate change scenarios based on computer modelling. Models involve simplifications of the real processes that are not fully understood. Accordingly, no responsibility will be accepted by CSIRO or the QLD government for the accuracy of forecasts or predictions inferred from this report or for any person's interpretations, deductions, conclusions or actions in reliance on this report. Assertion: The Great Barrier Reef has experienced about 7-10 bleaching events since 1979. No bleaching events are known before this, and the events result when the ocean temperature SST rises about 1 deg. above the summer long term temperature. If we keep going, the reef will bleach every year by 2030. Reality: Bleaching events on coral reefs are caused less by regional ocean warming per se than they are by the localised warming that occurs in areas and times of low wind conditions. Bleaching events have been reported since 1979 because it is only after that date that a network of scientific observers was established on the reef. There is no evidence that any of these events was due to human activity, and to suggest that no similar natural events occurred before 1979 is silly. In any case, the sea surface temperature of the Great Barrier Reef shows no change over the last 30 years, and the speculation that the reef will bleach every year by 2030 doubtless represents the projection of another of those legendary, and legendarily wrong, computer models. 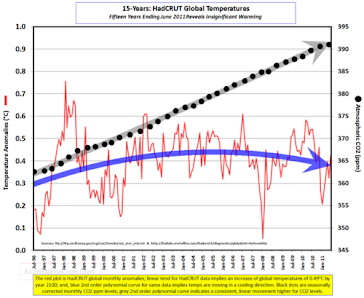 No global warming for the past 15 years?!? Please present evidence. Look at graph to the right of the article Drewski and you will find your proof. From an authoritative source, it compares CO2 increase against global temperatures.